F Robin Figren (Calgary, Edmonton, 2006-08) has signed a two-year contract with HV71 Jönköping (Sweden, SEL). This season, he had 11 goals and 10 assists in 48 games with Frölunda Gothenburg (Sweden, SEL). The Prairie Hockey Academy, which is located in Caronport, Sask., announced on Wednesday that Scott King has signed on as its director of player development. King has been with the Moose Jaw Warriors, as an assistant coach and player development coach. . . . The PHA is Saskatchewan’s first Hockey Canada Sports School. Before joining the Warriors for this season, King was with Hockey Canada as its head skills development coach. . . . King, the son of well-known coach Dave King, played one season (1996-97) with the Kelowna Rockets, before going on to a professional career that included 14 seasons in Germany. Taurean White is the new general manager and head coach of the MJHL’s Swan Valley Stampeders. White spent the previous two seasons as the director of hockey operations and head coach with the Kingston Voyagers of the Ontario Junior Hockey League. . . . With the Stampeders, he replaces Erik Petersen, who was fired on Feb. 27. Petersen had been GM/head coach for four seasons. He has signed with the Danish team Vojens as head coach for next season. In the QMJHL, the visiting Saint John Sea Dogs won the President’s Cup with a 5-1 victory over the Blainville-Boisbriand Armada. The Sea Dogs swept the championship series; the finished the playoffs with a 16-2 record. The Sea Dogs got four assists from F Mathieu Joseph in the victory, while F Spence Smallman had two goals and an assist, and F Matthew Highmore added a goal and two helpers. . . . Announced attendance: 3,500. . . . In the OHL, F Warren Foegele scored three times and added two assists as the Erie Otters beat the host Mississauga Steelheads, 5-2. The Otters lead the championship series, 3-1, with a chance to wrap it up on home ice on Friday night. The announced attendance last night was 4,418. . . . The 2017 Memorial Cup is to be held in Windsor, Ont., May 19-28, with the OHL’s Spitfires as the host team. goal, while D Austin Strand and D Ethan Bear each had two assists and Gropp had one. . . . The Thunderbirds got 18 saves from G Carl Stankowski. . . . Regina starter Tyler Brown was beaten six times on 24 shots through 40 minutes. 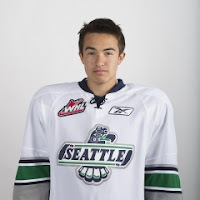 He sat out the third — the first time in these playoffs that he’s been on the bench — with Jordan Hollett coming on to stop all 12 shots he faced. . . . Seattle was 2-7 on the PP; Regina was 1-3. . . . Regina scratches: F Adam Brooks, D Dawson Davidson and F Jake Leschyshyn, all with injuries, G Max Paddock, F Duncan Pierce and F Owen Williams. . . . Seattle’s scratches: G Rylan Toth (injured), F Elijah Brown, F Tyler Carpendale, F Dillon Hamaliuk, D Jake Lee and F Luke Ormsby. . . . Jon Ryan, the veteran punter with the NFL’s Seattle Seahawks, took part in the ceremonial faceoff. From Regina, he stayed neutral by wearing a Switzerland t-shirt. . . . 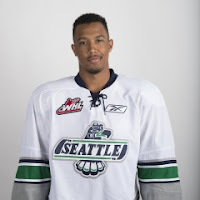 Some notes from TBird Tidbits (@TBirdTidbits): The Thunderbirds have set a franchise record for victories in a single playoff year (14). . . . Stankowski has set a Seattle record for most victories in a single playoff year (14). . . . Stankowski also holds the Seattle record for career playoff victories by a goaltender (14). . . . Announced attendance: 4,652.